Oh dear. I always feel so embarrassed about my blogging breaks, which for the past two years have seemed just about endless, that I’ve put off returning to blogging this time for just that reason. But I miss you. I miss gushing about books out loud instead of just in my head. I miss all of the learning and laughter and challenging perspectives and vitality of this community that have helped me grow into a better woman than I’d otherwise be. So here I am. I believe this time a return is sustainable, as I’m typing this on a desktop mac instead of my old laptop. A separate screen and wireless keyboard allows for a much more ergonomic set up, and the newest Apple operating system includes all kinds of useful accessibility features, even a dictation program. As for me, I’m still living in Texas for now, still hoping to move to upstate New York within the next few months. At first I was terribly upset to have missed my ideal May deadline, but eventually I tired of those feelings and decided to embrace the good things of summer. I’ve been creating homemade popsicles, wearing breezy clothes, enjoying the long summer twilights, learning to distinguish birds by their songs, gorging on local peaches, and spending a lot of quality time with my family. The weather has kindly colluded in my enjoyment by staying overcast much of the time and limiting itself primarily to highs in the nineties instead of hundreds. Of course, I’ve also been doing a lot of reading, both in print and via audiobook, which are the perfect accompaniments to the knitting I now find myself addicted to. The same weekend I brought home the new computer, I also found a little couch whose botanical pattern has tempted me to rename my blog as A Floral Sofa. The subsequent room rearrangement turned out to be perfect for summer, and I spend many a happy hour knitting and reading while watching out the window, as geckoes and birds go about their business. It’s funny how such a fairly small thing can impact daily life so much, but my couch (which only cost fifty dollars plus a couple of backbreaking sweaty hours getting it inside) has done so. My new computer has done so too, and now that I’ve conquered by feeling of shyness, I look forward to catching up with all of your lives as well, happy in the knowledge that I can read blogs to my heart’s content without destroying my hands. And oh I have so many books to tell you about. I cannot wait to begin. So good to see you back. I can’t wait to hear about the books! Some people come and go so quickly here… I like to see you coming in again. Thanks Jeanne. :) I’m certainly glad that so many of the bloggers I’ve known for years are still around. I miss the ones who have left. Welcome back to the fold Eva. Sounds like you are learning to balance life pretty well. Happy to see you are back. Let us hear about books and all other good things in your life. So good to hear from you again! I’m glad you were able to let go of your feelings of guilt, both regarding your absence and your delayed move north. All you can do is your best and understand that sometimes things work at their own pace, which isn’t always as swift as we might like. I’m glad you’re feeling better and I look forward to reading your bookish musings in the weeks to come! Very wise words Steph, and ones I’ll remind myself of when that guilt tries to return. I like how you positioned yourself in the photo with the mirror. Well done. I’m excited you are back! Oh, Eva, it’s wonderful to see you back, and what a very beautiful picture above. 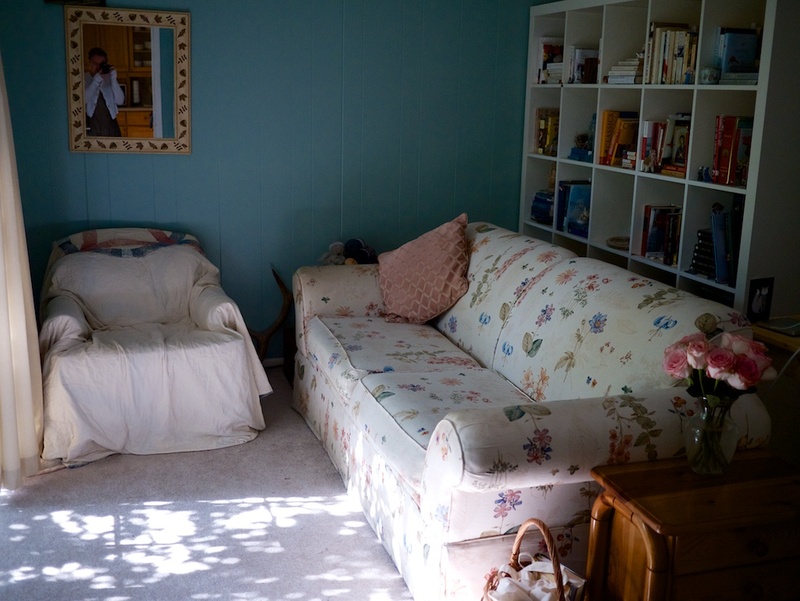 I can certainly understand the allure of that lovely floral sofa in such a robin’s egg blue room! Glad that you have found a way to return to blogging, as I miss your incisive thoughts and wonderful bookish discoveries. Thank you Melanie! I’m sure I’ll discover lots of good books when I catch up on your blog! woo hop you’re back. Good to see your bookish self back and love the floral sofa. Don’t leave us again for awhile. We want to hear all about your books. Hi Julia! Tiger Mother made a big splash in the US when it was published, but I didn’t read it. Hope you enjoy it. Welcome back, Eva! That looks like a delightful room. I’ve missed your posts – both bookish and non – so can’t wait to hear all about what you’ve been doing and reading lately. Hey! It’s so nice to see you back! I have been in and out too. It’s called LIFE. We understand! Welcome bacck. You made me laugh Rebecca! Very true & a good way to put breaks in perspective. So excited to “see” you! I was just checking in here earlier in the week to see if I’d missed any posts. The weather has been unusually mild in Texas, hasn’t it? It’s cloudy and in the 60s today, which just knocks my socks off. Oh I’m suddenly jealous of north Texas: we haven’t had anything like the 60s. But I’ll take high 70s, 80s, even mid 90s over 100+ every day! I’m so glad you are back and am looking forward to your upcoming posts. The floral sofa is quite lovely. It looks so inviting and seems like a nice comfy space for knitting and reading. Thanks Raquel: it is very inviting! Yay! I love the sofa, too – I think it would go very well with a striped armchair and then you could have OPTIONS in where to veg out and read :-) Welcome back – so glad to see you again! I’m so so glad you are back and that you have a new computer that can accomodate your needs :). Your Summer and Summer reading sound delightful! Thank you Jo: it’s definitely been a good summer! And I’m so grateful to the new computer. Welcome,welcome back Eva! What a pleasant surprise. Oh my, this made me so happy that tears welled up. Really. :) The bit about changing your blog name to A Floral Sofa made me giggle. Okay, now off to email you like I should have a week ago! And I can’t wait to hear all about them! You’ve been missed, Eva, so I’m delighted to hear from you again. I finally broke down and got a wireless keyboard and mouse at Christmastime to go with my laptop. The somewhat more ergonomic correctness of it all has definitely helped me. Typing and mousing was definitely getting way too hard on my poor unfortunate joints, so I love my new set-up. Glad yours is working for you, too! Yes, technology is fabulous! :) Do you use a regular mouse or the trackpad? I got the regular one, and it’s SO much nicer than the trackpad on my fingers. Hi hi hi hi!! I missed you! I am so pleased you are back, and I hope you can stay! Your new sofa is adorable, and I missed you! HUG. Hi, Eva! I’m so pleased to hear from you. So much so that I’m crawling out of my own blogging absence to say hello. Welcome back, Eva! So wonderful to see you back :) Nice to know that you are enjoying the summer. Looking forward to hearing about all the wonderful books you read. Your new sofa is beautiful – love it! Welcome back! You don’t need to apologize for your blogging breaks. The important is that you’re back. Thank you Smithereens: I’ll remember that! Welcome back! It is so nice to see your blog pop up on my blog reader and to hear what you’ve been up to! Welcome back. I can completely empathize with the recurring blog hiatus. Finding the perfect balance that allows one to blog can be incredibly difficult. But oh boy does it sound like you have been enjoying yourself in the world beyond a computer. And I love the new sofa. Looking forward to hearing about your reading adventures! Yep, working blogging back into the schedule hasn’t quite happened yet. But I have hope: just need to make it a regular part of my routine again! Good to see you back, Eva! We understand, life gets in the way sometimes. I hope your new setup continues to work out for you– and the couch is certainly lovely! Welcome back dear friend! I have not been very good at blogging or reading other blogs either as life has just been full. I am looking forward to keeping up as best I can. In summary, the big news on my front is that I left a job that was not a good fit, I am taking the bar exam again in a few days, and I am just about 8 months pregnant!! Looking forward to catching up with you more!!! How nice to see that “Hello” email sitting in my inbox this morning! Welcome back! I was thinking of you the other day, Last month really. Glad to see you back at it. I’ve missed keeping up with the non-fiction world you cover so well. I’m always so happy to see a post pop up from you here. I’m just happy to hear about your summer and your lovely set up and all the wonderful books you’ve been reading.